Torquay United's chief executive Steve Breed says 129 people have applied to be the Gulls' new manager. Paul Cox resigned from the financially-troubled club last week after being told they would not be able to pay him. The Gulls have also seen director of football Dean Edwards leave and have not won a match in over a month. 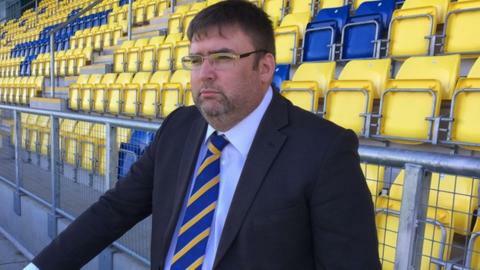 "129 managers can't be wrong that Torquay United is still a desirable place to come and ply their trade," Breed told BBC Sport. Breed says 60 of the applications are being looked at 'seriously' and the club have already made contact with candidates. "I've met with two managers, I've got another three appointments on Wednesday with other managers, so we're pro-active," said Breed, who is set to meet a further three candidates on Thursday. On the field the club has gone through a tough time, losing 7-3 to Bromley on Saturday - their worst home defeat since October 1995 - and being defeated by Boreham Wood on Tuesday night. But, off the pitch, Breed says the situation is improving with the club coming to an agreement with former boss Chris Hargreaves and a number of other employees who have left Plainmoor. "Myself and Chris are almost at agreement, we're just waiting for paperwork to be signed," said Breed, who was part of a consortium that took over the club in the summer. "Lee Hodges (Hargreaves' assistant) remains on gardening leave, but there's no real issue with Lee at all. "There were two other situations and they have both been abated completely. "I would like to thank the two employees - I'm not going to mention who they are - but they weren't really issues brought on by this regime. "Apart from waiting to sign paperwork with Chris Hargreaves, those situations have gone away, which is excellent news for the football club."